A key milestone for any company, but more so in the fickle culinary business, iconic restaurant Karavalli at The Gateway Hotel turns 25 on June 20 this year. 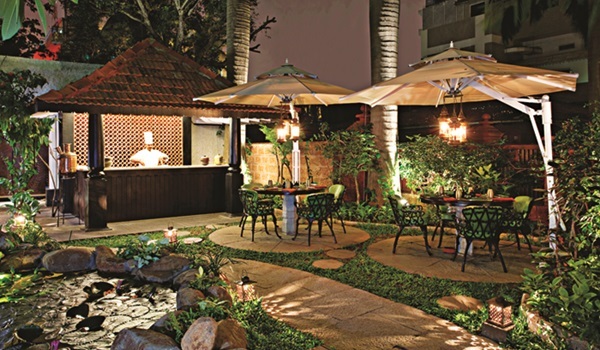 Marking the date, the specialty restaurant helmed by executive chef Naren Thimmaiah relives their past. The face of Karavalli since its inception in 1990, Thimmaiah says that while the restaurant may have evolved, nothing has really changed. a�?In fact, our a�?newesta�� staff member has been here seven years now, with me and another few being around since this baby was born,a�? he quips, adding that they picked the South West coastal cuisine because Taj (as it was called then) wanted to set up regional specialty cuisine restaurants in each of their properties. a�?As spectacular and surprising as the countryside is, the cuisine of its many communities were confined to family kitchens, until Karavalli zoned in on them,a�? shares Thimmaiah. Unchanged in the past two decades, Thimmaiah says they still source ingredients such as red chilies, coconut, pepper, spices, fresh fish, meats and vegetables from the coast, and more specifically perfectly smoked Kodumpuli from Kerala, toddy vinegar from Goa and Kundapur coconuts for their firm white flesh. a�?To capture the cuisines perfectly, the chefs have trained in the kitchens of traditional homes and continue to go back from time to time to update our menus,a�? he shares. It is no wonder then, that this niche restaurant finds itself on Asiaa��s Top 50 restaurants and in Phalloidin Booksa�� Where Chefs Eat a�� A Guide to Chefs Favourite Restaurants by Joe Warwick. Back home, food critic, journalist and author Vir Sanghvi is a fan and so is Deepika Padukone, whom the staff claim has been seen here from her days in pigtails to gliding in as Bollywooda��s favourite star. Pulling out all stops to celebrate, the team brings back 25 classics which have been the draw. Indulge Bangalore, got a sneak peek of the grand menu a week ahead of its launch. Starting off with the timeless meen eleittad (from Kerala), we were swept with nostalgia as the pomfret in Malabar masala came wrapped in a banana leaf and tasted just as it did many moons ago. The robust prawns, one of Karavallia��s best-loved dishes, tossed in Kerala spices, ginger, coconut slivers and lemon juice whetted our appetites nicely. 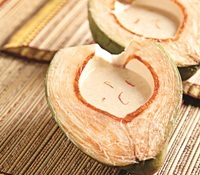 But it was koli barthad from Coorg, flavoured by the tart Kachampuli vinegar, which stole the show. Not surprisingly, we later learned that the recipe was Thimmaiaha��s own mothera��s. Since this menu doesna��t strictly differentiate between mains and starters, we picked lamb cubes cooked following a recipe from Travancore, redolent with spices like fennel as one of our mains. Chicken and vegetable stew followed, to be mopped up by pillowy appams and mutton curry in a thick cashew paste. Vegetarians needna��t fret as mangoes, mushrooms, baby potato and raw banana all feature too. Pork sorpotel, Moplah favourite pothi choru (a combo meal of rice and meat curry, steamed in a banana leaf) and the ever-popular kori gassi (A Mangalore style chicken curry) are on the cards too. Make time to chat with the team, who will hover over your bale eley (banana leaf) to load you with food, and regale you with anecdotes about Karavalli and its visitors including author Ramchandra Guha and cricketer Rahul Dravid. If chef Thimmaiah is around, you best take notes for a lesson on food, culture and history too! Rs.3,500 for two. At Residency Road. 1. Flipping through the menu at Karavalli is like diving into the food, customs, culture and history of the South West coastal regions of the country. The menu represents cuisine sourced from the Bunts of Mangalore, Coorgs, Moplahs of Malabar, the Portuguese descendents of Goa, Maninka Brahmins of Mangalore, Syrian Christians of Travancore and the Kavya Brahmins of Vitla (South Karnataka). 2. Long before hipster eateries and Castro bars in the city were plating food onto traditional brass plates and tiffin carriers, Karavallia��s Tiffin Carrier concept was serving up a quick meal in a brass tiffin carrier, an express version of the Thalia. A brass miniature para or plate with rings is lined with banana leaf to serve rice, tiny brass steamers are used to serve idiappams, cane mats are used to dish up delicate neer donas and clay chatties (a clay vessel with a lid) are used to serve wood-fired curries and cast iron chatties make sure that the appams arriving on your table are as delicate as lace. 3. The pothi choru, a crowd favourite on the menu, a classic rice and meat curry steamed and served in a banana leaf parcel, is the restauranta��s tribute to a traditional Kerala meal carried on long distance journeys. 4. Karavallia��s curries are known for being cooked in clay pots on wood fires. The clay chatties or pots give the curries an earthy flavour and the wood fires, a smokey overtone. The restauranta��s smoky meen Vevichathu is cooked in a similar method. 5. Known for its regional ingredients, Karavalli sources its boiled rice from Kuttanad, the rice basin of Kerala, IR8 Rice, a soft textured rice for its appams, and jeera samba rice, a small grained flavourful rice from Calicut which makes the base for the Calicut biryani and ada. Rice flakes made from a paste of rice flour and spread on cane mats thinly to sun dry in Kerala, are used in the menua��s ada pradhaman, a payasam. Byadagi chillies from Dharwad, Kane or lady fish sourced from the estuaries of Mangalore and used in the kane bezule, a fried fish specialty from Kundapur, and mussels from Calicut are popular here. 6. Of Karavallia��s entire team of chefs, a sizeable number are women who are also homemakers. A concept introduced by chef Thimmaiah, homemakers are often sought out to teach traditional and authentic fare to the kitchen staff at Karavalli a�� a successful format, now duplicated at Gateway properties across the country. there and eat pothi choru is almost embarrassing! on the seafood and more importantly, appams here.